Prior to installing the server, prepare a service area that provides enough room to install and service the server. Caution - You must provide the following service area for the server. Do not attempt to operate the server in a smaller service area. Note - The length between the two door pivot points is 56.5 in (1435 mm). The depth of the server without doors is 53.6 in. (1362 mm). 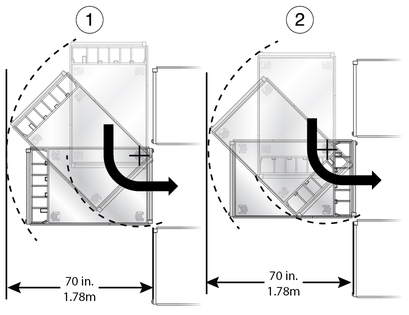 When turning the server, temporarily provide additional space in front or rear of the installation site beyond the minimum aisle width. The server requires at least 70 in. (1.78m) of space to turn.